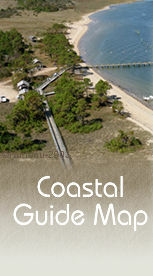 The map below provides detailed location information for many of the beach ramps along the Outer Banks. Note that occasionally the Park Service or townships will close or move ramps due to storm damage, wildlife habitat protection, or construction projects. Only permanent changes will be noted here. You can download my KMZ file and explore all these dune ramp locations virtually. Sound side recreational access for boating, canoeing, kayaking, sailboarding, para-surfing and other activities within the park is available via the many access roads along the west side of Hwy. 12, though few are clearly marked. Unless chained off with signs indicating no entry, most unmarked dirt roads on the west side of Hwy. 12 are for public access. (N 36.39574 W 075.82954) just north of Corolla, providing access to Carova and other communities north to the Virginia line. The first few miles have no ramps off the beach because of wildlife preserves which are closed to any vehicular traffic. North of the wildlife preserves numerous ramps provide access to homes in the Carova area. A fence at the Virginia line prevents access north of Carova. From Corolla south to Nags Head, there are numerous beach access ramps, but some areas require permits, and seasonal restrictions may also apply. Check with individual townships before venturing onto the beaches. Within the National Seashore a permit is required for any vehicle access to the beach, including all numbered ramps below. Ramp #43 - N 35.23550 W 075.52740, from NC 12 in Buxton, turn south at Cape Hatteras Lighthouse sign. Continue past the lighthouse entrance, past the Coast Guard Station until road ends near Cape Point. Ramp #44 - Same directions as Ramp #43, you will pass Ramp #44 as you near Ramp #43. Ramp #49 - N 35.23454 W 075.60893, from NC 12 in Frisco, north of the Frisco Pier, turn east onto Billy Mitchell Road. Follow road past the airfield until you reach Cape Hatteras Campground. Ramp #49 road begins at campground entrance. Ramp #55 & 57 - N 35.20596 W 075.70382, take NC 12 to south end of Hatteras Village just past the ferry dock. Both ramp entrances are across from the Graveyard of the Atlantic Museum. Ramp #59 - Just south of the ferry dock, north end of Ocracoke Island. Access here is only to the north to reach Hatteras Inlet. Southward between Ramp #59 and #67 is closed year round. Ramp #67 - Just south of the Pony Pen. Access southward only from Ramp #67. May be closed in winter months. Ramp #68 - Next to Ocracoke Campground. May be closed in summer months. Ramp #70 - At airfield entrance, just north of Ocracoke Village. Ramp #72 - Take South Point Road (dirt) at edge of Ocracoke Village (across from Howard's Pub). Ramp is at end of road.